And today, THIS . . . THINGS ARE GETTING VERY CREEPY! Read the actual White House draft by clicking here. P.S. and CREEPIER STILL. 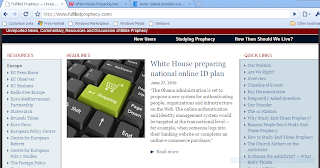 This was from 2 years ago and was referenced on current story on REAL ID Plan ! (CNN) -- The Supreme Court has ruled against a Christian campus group that sued after a California law school denied it official recognition because the student organization limits its core membership to those who share its beliefs on faith and marriage. At issue was the conflict between a public university's anti-discrimination policies and a private group's freedom of religion and association. The 5-4 ruling was written by Justice Ruth Bader Ginsburg, who was on the bench a day after her husband passed away. The law school, wrote Ginsburg, "caught in the crossfire between a group's desire to exclude and students' demand for equal access, may reasonably draw a line in the sand permitting all organizations to express what they wish but no group to discriminate in membership." In dissent, Justice Samuel Alito wrote, "I do not think it is an exaggeration to say that today's decision is a serious setback for freedom of expression in this country." He was supported by Chief Justice John Roberts, and Justices Antonin Scalia and Clarence Thomas. I am between dental appointments and on the run this morning, composing this from my netbook computer over an early lunch. I will be writing more of this later and would appreciate your comments. It looks to me as though our society might be even less righteous than Sodom and Gomorrah. At least they had a disapprover of their loose sexual customs sit over them as their Judge -- Lot, nephew of Abraham. We have those sitting in our gates who applaud same. I was signing off to go home to bed and decided to check my email first. This was in my "Barcelona Process" google alerts. The title speaks for itself. I wish Herb Peters were here to talk with about it, but the fellows from "borntowatch.com" and "fulfilledprophecy.com" are and I hope they will pay close attention. The EU should now actively support a reconciliation process, which must result in elections without further delay. This could provide a way out of the EU being limited to dealing with Fatah instead of an elected, representative Palestinian government – an important condition for any attempt to reinvigorate credible peace talks. And, crucially, this must kick-start a re-energised EU approach to building democracy in the Occupied Palestinian Territories (OPT). I carried out a large number of interviews with Palestinian politicians, civil society representatives, academics, activists and artists in the West Bank and East Jerusalem in 2010: these show that the EU is fast losing goodwill among key sectors of the Palestinian population. The EU’s democracy building agenda in the Mediterranean started with the Barcelona Process and the establishment of the European Instrument for Democracy and Human Rights (EIDHR). However, it experienced a slow start. Following the Oslo Accords and the establishment of the Palestinian Authority (PA), the EU was willing to tolerate authoritarian rule and human rights violations by President Arafat for the sake of keeping alive the peace process. This changed with the second Intifada, and the 9/11, London and Madrid terrorist attacks. Both the Bush administration and the EU changed course. While the policy had hitherto been built on the belief that successful peace was a condition for democratisation, this assumption was now reversed. The new approach also meant a change of stance towards the Palestinian Authority. In 2002, the EU set out to limit Arafat’s presidential powers by urging the PA to introduce the office of a prime minister; by fostering the rule of law with an independent judiciary and the call for the abolition of the infamous state security courts; by fighting corruption within the PA through the introduction of auditing mechanisms; by placing revenues under the auspices of the ministry of finance; and through an attempt to enhance the oversight capacity of the Palestinian Legislative Council.Subsequently, the democracy agenda received a boost with the introduction of the Action Plans in the frame of the European Neighborhood Policy (2004) and an upgrade of the EIDHR (2006/07).2002, the EU set out to limit Arafat’s presidential powers by urging the PA to introduce the office of a prime minister; by fostering the rule of law with an independent judiciary and the call for the abolition of the infamous state security courts; by fighting corruption within the PA through the introduction of auditing mechanisms; by placing revenues under the auspices of the ministry of finance; and through an attempt to enhance the oversight capacity of the Palestinian Legislative Council. This approach was reversed after the 2006 elections, when the office of President Abbas was strengthened again relative to the office of Prime Minister Haniyeh. EU aid was once more distributed in opaque ways. In addition, the majority of EU aid (approximately EUR 530 million in 2007) is dedicated to short-term socio-economic relief, instead of sustainable, long-term support for institution building. An even smaller amount is allocated to civil society capacity building. In recent years, funds for democracy have been modest and have concentrated on fighting corruption in the executive (EUR 27 million from 2004–2008), election support (EUR 20 million from 2000–2006), and on fostering the Palestinian judicial system (EUR 8 million from 2004–2008). Bottom-up democratisation through civil society bodies receives a maximum of EUR 1.2 million per year through the EIDHR. How this will all play out certainly makes for interesting and prayerful study. The conclusions call for the EU to give more quarter to Hamas than they have already given. This is an article I might expect from Al Jazeera. I was somewhat taken back to see it from a Hebrew University source. Thus, if the EU is serious about building democracy in the Palestinian quasi-state, an honest encouragement of Palestinian national reconciliation – including some kind of engagement with Hamas – appears to be crucial. This would not only support the EU’s democracy agenda and restore its image, but also provide an important precondition for reviving peace talks and helping the conflicting parties out of the current deadlock. Secondly, Palestinians barely distinguish de - mocracy promotion from the EU’s general foreign policy towards Israel and the OPT. Many interviewees, including Sari Nusseibeh, Palestinian academic and Director of Al Quds University, claimed that they are living under an ‘unfolding reality of Apartheid’ and that the two-state solution is on the verge of collapsing, which makes European democracy promotion towards the PA all rather pointless. Palestinians expect the EU to exert more pressure on Israel, particularly regarding the application of different laws towards settlers and Palestinians (Israeli versus military law), the constraint on the freedom of movement, and the holding of elections in East Jerusalem in accordance with the Oslo Accords. Rami Hamdallah, Secretary General of the Palestinian Central Elections Commission, and many others, referred to the difficulties of carrying out elections under the restraints of occupation. The EU could be much more assertive towards Israel in this respect. J.D., blog forum participant par excellence, and owner of the blogspot THE DEVIL IS IN THE DETAILS phoned me to ask what I knew about "U.S. Social Forum" which is having a big doing in at least Detroit, Michigan this week. I commented on a radio program the other day how very similar that sounded to the old Planetary Initiative for the World We Choose organizing tactics used by Donald F Keys and company in the 1980's. I have invited J.D. on tonight to discuss it on the air. Please join us and be sure to call in at 888-747-1968 and/or join us in the chatroom at www.themicroeffect.com. Click "listen live" to listen to the broadcast through your headphones, ear pieces and/or speakers. Click on the chatroom to assign yourself a user name and password and input your questions there. Back in 1999, I was feeling as though perhaps I was reading too much into things and seeing things where none existed. I had been heavily researching Javier Solana de Madariaga since discovering him on the early morning of November 22, 1995. This was during the 10 days of November 1995 that Solana rose from comparative obscurity as a mere European cabinet minister -- one of many -- to rapid worldwide prominence as head of NATO. The promotion was deemed astonishing by the press in those days because Javier Solana had been a confirmed active Marxist in the early 1980s. He had been best known for haranguing crowds in those days with the chant, "We are radically opposed to NATO," referring to his opposition to Spain's proposed entry into that military alliance. In 1999, Javier Solana would be given exclusive military authority over NATO's military operations, most unusual powers for a job usually ministerial in scope and authority -- a job where he was normally to receive directions and orders from the NATO member countries and then pass same on to his military men. Solana was given the military authority to make the decisions on his own on January 30, 1999. President Clinton would proclaim on American television on March 21, 1999, "I agree with Javier Solana's decision to do this." He was referring to Solana's orders to bomb the former Yugoslavia and hits capital city Belgrade in retaliation for Serbian recalcitrance in handing over their Serbian Orthodox Church center of Kosovo to Albanian interests. I then noted that the scope of military power accorded Solana was unusual and communicated my thoughts on that to many. Later that year, I would learn that Solana was leaving the NATO position a little early -- to go to Brussels and serve as the High Representative for the Common Foreign and Security Policy of the European Union. That job was created in early December 1998 by Section 666 of the European Codified Documents. Approximately one month after leaving NATO for the new EU position which also included as serving as Secretary General of the Council of Ministers of the European Union, it was announced on or about November 20, 1999, that Javier Solana was to wear still another important hat "for one year." The Western European Union, a ten national military federation, announced they were dissolving and folding their power into the CFSP office of the EU, but for their "last year" of operation, Javier Solana would be in exclusive control. That included the title of "Secretary General of the Western European Union" in addition to his other lofty ones. Given the obvious prophetic similarities, I began to wonder, "am I crazy? . . . am I seeing things that nobody else is seeing? . . . am I reading too much into this?" I did an internet search one day, as I recall, in early December 1999 to see if anybody else was watching this and discovered a column by one Herb Peters, a California religious writer. 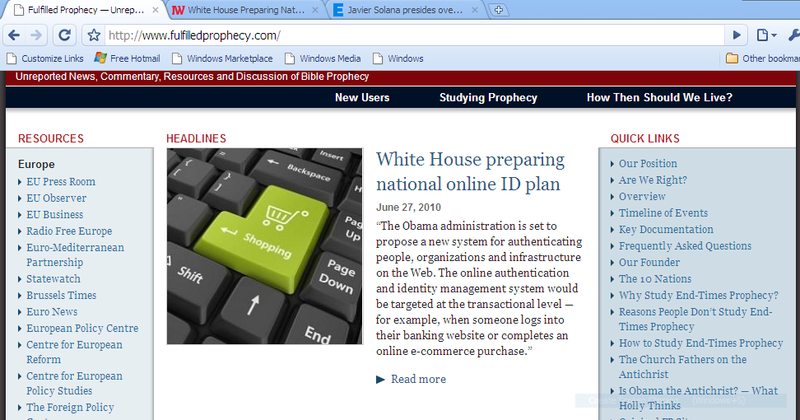 I called the newspaper sponsoring the website where the article, "It is wise not to ignore Biblical prophecy" appeared. They gave me Mr. Peters' number. I telephoned him and as recorded in his book, RECOMMENDATION 666, the rest is history. Javier Solana was expected to assume the new post of High Representative under the Brussels Treaty after earlier constitutional ratification attempts were defeated by EU voters at the polls in France and Holland. A salary was set for the office which made it the highest paid political office salary in the world. He had already been voted by the Council of Ministers to be the designated new and powerful "Foreign Minister" for A subsequent attempt to put similar measures into place with the "LISBON TREATY" was rebuffed by Irish voters. It was clear from much of the Irish press that there were justifiable fears of the considerable powers being handed Dr. Solana. Shortly before a second Irish referendum was held, Dr. Solana made a surprise announcement that he would be retiring in October before any new treaty (the Irish referendum had not yet been held). It was expected that there would be jockeying for the position, but as it turned out, every well qualified aspirant decided they did not want the job. A relative political unknown, Catherine Ashton, a European Socialist who had an appointed position to the British House of Lords was surprised by being told the job was hers. The migraine headaches she must have received for the stresses of taking that job more than justify the salary -- a salary that was obviously set for Dr. Solana's benefit and not her own. Those of us watching this scene closely believed that Solana was planning a comeback or had better plans with larger organizations than the European Union. Since leaving office, he has continued running his Grandfather/"Great Uncle"/Distant Cousin (whatever)'s Madariaga Foundation. He also has been appointed to numerous prominent boards and offices including but not limited to the Brookings Institution, Trilateral Commission, and ESADE. He was before his "retirement" and continues to be one of the most influential voices on "global governance." No wonder that Javier Solana’s role as the West’s envoy to Iran won him many fans among Democrats and moderate Republicans. His part inpreventing a meltdown was arguably a greater contribution to security than all the EU’s peace operations combined. "Obama maintains the idea of service to a historical mission for the US: the important job of guaranteeing global security. But, unlike his White House predecessors, Obama's National Security Strategy recognises the value of partnerships; attaches greater importance to the civilian dimension as opposed to the military; and stresses the value of dialogue and the need to reinforce international institutions. "This is a good sign for a world with different power centers and interests, with resources and legitimacy remaining tied to the nation-state, but in which challenges (climate change, armed conflicts, pandemics, and transnational crime) are global and, therefore, require cooperation among states. We are in a transition period: international interconnection is increasing, as the global economic crisis has shown, but the management tools and mechanisms to guarantee the smooth operation of governments are still not being shared. Obama's new National Security Strategy shows a political willingness to back an international order able to tackle these challenges. "The road ahead is not free of difficulties, but the [Obama] Strategy represents a decisive step towards solving the challenges of the 21st Century and preparing us for the world of tomorrow. "*JAVIER SOLANA the European Union's former High Representative for Foreign and Security Policy, and a former Secretary General of NATO, is President of the ESADE Center for Global Economy and Geopolitics. I fear that many have gone back to sleep on the important global governance catalyst who happens to be named "Javier Solana." I discovered the other night that there is an important website that has been doing a yeoman's job of ferreting out information and passing it on to us in the context of its obvious prophetic implications. That website is called "www.borntowatch.com". It is my honor to interview tonight on my radio program one of the two brave men running this website. Tune in at www.themicroeffect.com at 8 p.m. tonight. I understand the material may be rebroadcast this weekend as well. Archives are accessible for a modest fee at www.themicroeffect.com. The $20.00 charge for unlimited access to all programs on the network go to help Joe McNeil cover his costs for running it and making these resources available to us. You are further free to recopy and recirculate materials you extract from it. Tune in tonight and stay tuned. To illustrate the seriousness the global governance scene and the confidence of its proponents, I have put choice illustrations at the top. You may expand each and all to full page by clicking on the pictures. Nothing appears to be slowing on the anti-Israeli front. Fulfilledprophecy.com had this link and it also deserves full exposure here. Looks like a long, hot summer. ANSAmed) - BEIRUT - Hamas said today that it is in favour of a reintroduction of EU inspections at the land border crossing of Rafah, between Egypt and the Gaza Strip, and the presence of EU ships off the coast of the Gaza Strip to inspect ships headed towards Gaza, ''so long as Israel does not interfere''. After a proposal launched by French Foreign Minister Bernard Kouchner to allow the EU to inspect traffic towards the Gaza Strip to assure the arrival of humanitarian aid, a Hamas political official in exile in Damascus said that ''European involvement would be welcome, but according to set conditions''. Speaking to pan-Arab network Al Jazeera, Izzat Rishq said that ''Hamas does not have any problem with accepting the reintroduction of European inspections at the Rafah border crossing, so long as there is no interference by Israel''. The EU BAM-Rafah mission (European Union Border Assistance Mission), which started at the end of 2005 and is formally still active, was suspended in June of 2007 for security reasons. ''As for sea inspections, we are ready to evaluate the proposal, as soon as it is formalised, but also in this case, the condition is that the Israeli authorities do not interfere directly or indirectly,'' said the Hamas official.(ANSAmed). We need to watch this and related developments closely. UPDATE: Important news regarding EU-Med / Barcelona Process / European Neighbourhood Policy which I missed. Thanks to the anonymous poster who gave links to a Finnish analysis of its meaning. Dr. Stanley Monteith is guest hosting me on his radio program tomorrow at 4 p.m.. Pacific time and I am guest hosting him on mine one hour later at my THEMICROEFFECT program, "MY PERSPECTIVE." Dr. Monteith and I will also be talking on the air Wednesday, 7 a.m. Pacific time which is 10 a.m. Eastern time. The New York stock market appears to be reverberating to European distress. This is a current Reuters video about the situation from a European perspective. Italy is now facing the same distress as many of the other EU countries. It is more than fascinating to me that all these developments seem to have developed since December, 2009. One might ask, which came first, the chicken, or the egg? Here's wondering to whom this crisis might equal opportunity? I have my personal suspicions. SALVADOR DE MADARIAGA - FORERUNNER OF THE EARTH CHARTER? The Earth Charter, championed by David Rockefeller and Maurice Strong may have well had earlier origins. A similar concept is mentioned by Salvador de Madariaga in an essay he contributed to the UNESCO predecessor, THE COMMITTEE FOR INTELLECTUAL COOPERATION and "A LEAGUE OF MINDS" for the League of Nations. This was set forth by Salvador de Madariaga. DeMadariaga is either the the Grandfather, "great uncle" or very distant cousin of Javier Solana, depending on which revised version of his genealogy one cares to believe. Those versions claiming he was his "great uncle" rely upon a supposed relationship that Javier's grandfather and Salvador de Mariaga were "cousins." Had that been true, they would have been only very distant cousins. Here is the current Wikipedia excerpt which contains the revised genealogy. Earlier Spanish ones plainly said that Solana was the "nieto" of Salvador de Madariaga, i.e. grandson. 'Solana was born in Madrid, Spain. He comes from a well-known Spanish family, being the grand nephew of Spanish League of Nations disarmament chief, diplomat, writer and European integrationist Salvador de Madariaga  (Javier's grandfather, Rogelio de Madariaga y Castro and Salvador de Madariaga were cousins). "My mother [Constance Archibald de Madariaga] was very close to the man who first brought Sufism to the west in our century-Hazrat Inayat Khan. I didn’t know him but as a child of eight, I was given my first Sufi name 'Hayat’ by him. It means’ life‘, and as my daughter wrote to me when she heard I was now called Praveeta’ that’s just a continuation - being pregnant with God.’ Inayat gave me my first name, and my whole childhood and adolescence was under the wing of this form of Sufis which came to the West. . . . Prabhu Praveeta: Oh! Don’t ask me! I was living all over the place. I lived in Geneva-working for 18 years with the United Nations’ FAO‘, being responsible for the Latin American of side grants and scholarships to people from underdeveloped countries-in England, In Spain, in France. Then after the war was over I went to Mexico and then travelling South America. Finally I went to Italy and there I’ve lived the longest period of my life. . . I knew Krishnamurti [the New Agers' collective candidate for "Maitreya" from 1910 through 1929] but I didn’t get on with him; I found him rather harsh. The others I’ve known were just flowering love and some of them were more reserved and quiet and you felt their radiance, but there wasn’t this communication at all . . ."
At any rate, the Alliance of Civilizations, Maurice Strong, Steven C. Rockefeller and so many others have been working hard recently to promote an "Earth Charter" which is a "New Ark of the Covenant." It was an integral part of the doings at the high level Alliance of Civilizations meeting recently held in Rio de Janeiro May 27-29, 2010. Click on the above picture to get a larger picture! "THIS Eastertide I have heen performing a self-appointed task, that of meditating on the role of the spirit in the modern world. It is natural that my meditation should take the form of a letter to you for I was thinking not so much of the Holy Spirit as of the Healthy Spirit which I fancy as that magnetism which flows from your piercing glance and from the electric bristles of your pepper and salt moustache. You were moreover one of the first to think with me that it is precisely this question of the role of the spirit in the modern world which is at the basis of what, in the jargon of Geneva, is known as Intellectual Co-operation. There, from the very beginning of the League of Nations, when I was only one of its acolytes, lay, for me, its real activity, and there, while politicians smiled, saw the very soul of the Covenant, the idea which, in two or three centuries, historians will possibly consider as the most fertile of those.-' which the first World Charter erected into universal laws." The preceding quotation paragraph was Salvador de Madariaga's "meditation" for what was the obvious predecessor for Donald Keys' 1981 "World Council of Wise Persons" and the Alliance of Civilizations "Group of Eminent Personalities." It was an entity they named "International Institute of Intellectual Cooperation" with its "League of Minds." I was fortunate to have found and obtained Limited Edition "numbered consecutively" 1002 of only 2,000 printed in 1933. I am putting up the Salvador de Madariaga chapter for which any copyright protection long since expired on my "Presentations for Downloading" link. Take advantage of it! My California friend, John W. Spring, has extensive experience in the petroleum drilling business and he offered to share his knowledge tonight with us on MY PERSPECTIVE internet radio. Here is a preview of what you can expect to learn from him. He sent it to me via email this afternoon, and I promptly invited him to discuss it ON THE AIR tonight, one hour from the time of this posting. If you miss it, Joe McNeill sometimes rebroadcasts it on the weekend or it is downloadable from the www.themicroeffect.com site. BROADER RAMIFICATIONS OF THE OIL SPILL DISASTER? "Before becoming an economic geographer, I served in the U.S. Coast Guard Reserve. My basic and advanced training took place at Cape May, New Jersey on the Atlantic Seaboard, which included actual experience at sea aboard a large cutter. But one statement that I will never forget was made by an old salt chief with hash marks covering nearly his entire sleeve. The chief said, "Accidents do not happen. They are caused by carelessness!" Later as a geography graduate student, I did extensive coastal research, which included reading almost all papers written about marine and wetland areas throughout the entire United States, before writing my M.A. thesis titled The Sunset-Bolsa Chica Area at California State University, Fullerton. I learned then, in terms of coastal ecosystems required for biota, natural habitat and fisheries, that the wetlands, salt marshes and mangrove swaps along the claw-like Mississippi Delta in Louisiana were by far the the most valuable coastal area for America because these are the nurseries for a significant portion of all marine life in the entire Gulf of Mexico. Later as a college geography instructor, besides teaching courses in world regional geography and economic geography, sometimes I taught geophysics and oceanography. My students would also share information with me in my oceanography classes and labs about off-shore drilling and its improved state-of-the-arts technology that included a series of back-up systems which would significantly reduce the possibility of oil spills--at least those caused by severe leaks from oil tankers. But accidents are caused by neglect or carelessness as well as by highly aggressive pressure and stress placed upon oil rig crews by their corporate officers. So, in all probability, it was this unrealistic economic pressure placed upon all personnel aboard this particular British Petroleum offshore rig, that led to this ongoing disaster. However, there is probably more information about this particular oil spill in the Gulf of Mexico that needs to come to the surface before we will understand the real cause behind this tragedy. At a distance of nearly 50 nautical miles offshore from the southern coast of Louisiana, British Petroleum, which is also known as BP, drilled one of the deepest wells ever attempted in the Gulf of Mexico. At such great depths, the oil pressure would be far greater than what would have been encountered in wells drilled much closer to shore at shallower depths. However, the alleged unfair labor polices of British Petroleum strongly suggest that crew members were forced to neglect safe operation systems and, instead, work hastily to soon generate a profit for BP's corporate executives and shareholders. But as we are about to discover, there is far more behind British Petroleum, which now owns and controls Atlantic Richfield Corporation or ARCO, in far darker and deeper areas. For instance, the main reason why Operation Desert Storm was carried out in the Middle East was to protect the interest of British Petroleum in Kuwait and Saudi Arabia. Yes, that is why U.S. troops were deployed in the Persian Gulf. By the way, recently in Iraq, most British oil interests have been sold to the Chinese. So, now, in Iraq, our American personnel are fighting also for the oil interests of the Chinese. In Afghanistan, American troops were deployed more than eight years ago mainly for the interests of British Petroleum and Chevron in the Caspian-Aral Basin for a pipeline route through Herat province in the western part of that war-torn nation. The war in Afghanistan is now America's longest war. Remember, we invaded Afghanistan before entering Iraq. British Petroleum and Chevron have already completed a pipeline from the Caspian-Aral Basin to China Proper in the PRC. The Peoples Republic of China is now receiving petroleum and natural gas for its military and industrial complexes. Do you understand the significance of this entire diabolical operation? Meanwhile, shrimp boats are not going out into the Gulf of Mexico. Public beaches in Louisiana are now empty of tourists. The economy of New Orleans is devastating. Why do we continue to allow foreign multinational corporations or MNCs to destroy our economy and run our military and foreign policy? Only because good people like you, who are not informed, continue to do nothing. So my question to you is very simple. Will you forward this message to others? If you need to reach me by mail, which is the best way, please write to: John W. Spring, P.O. Box 18946, Anaheim, CA 92817, USA. Thank you for spreading the truth. With kindest regards and a deep prayer that America will soon wake up to the real truth. To hear more from John W. Spring, join us tonight on the radio and STAY TUNED to all these fast breaking events.